An irritating pain in the buttocks and referring pain down the leg along the path of the sciatic nerve. Pain is aggravated by sitting, squatting or walking. When relaxed, the affected leg is often externally rotated. If the leg has been externally rotated for an extended period of time (i.e. driving long distances) the piriformis muscle can shorten. Continual internal rotation of the femur (result of prolonged pronation and poor foot mechanics) can cause the piriformis muscle to overwork and therefore increase in size. In both instances, when the leg tries to straighten out (i.e. 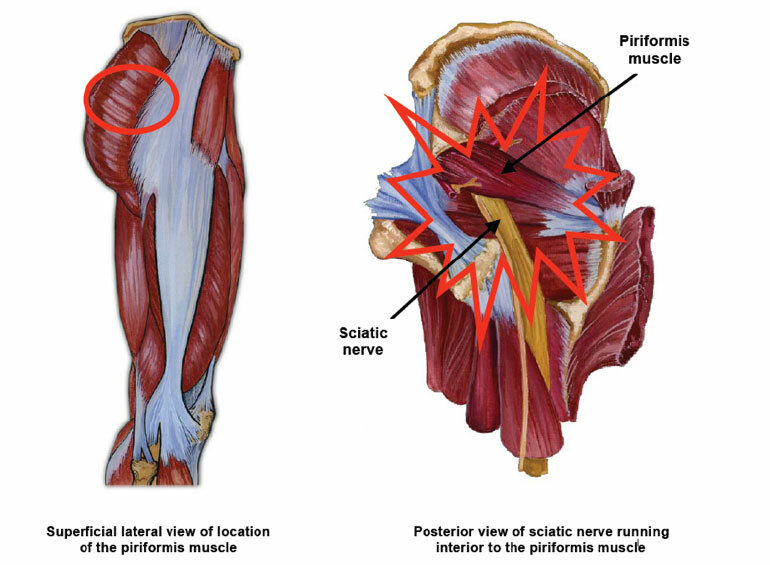 walking) the involved muscle compresses the sciatic nerve, leading to piriformis syndrome. Stretching of the piriformis muscle is necessary. Massage is helpful in relieving tightness. Faulty pelvic and foot mechanics need to be addressed. If internal rotation of the femur and prolonged pronation is evident, an orthotic device should be prescribed to arrest over-pronation and control the leg from internally rotating too much and too long.